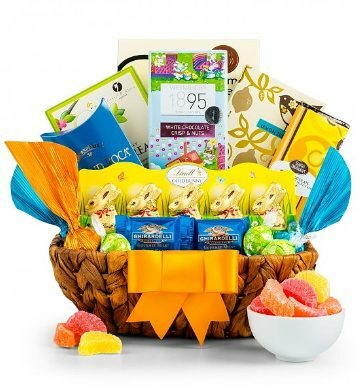 Lindt Chocolate Bunnies, Weinrich's White Chocolate Easter Bar, Ghirardelli Sea Salt Escape Squares, and a Seattle Milk Chocolate Truffle Bar all make this a most impressive Easter gift for snacking and relaxing. The award-winning chocolates are paired with gourmet selections that include Almond Roca, citrus gems, and more, all presented in a sturdy keepsake basket with a hand-tied satin ribbon. This gift includes the following: Lindt Chocolate Bunnies 1.7 oz., Almond Roca .82 oz., Lemon Tea Cookies 2 oz., Chocolate Covered Pretzels 4 oz., Citrus Gems 5 oz., Seattle Milk Chocolate Truffle Bar 2.5 oz., Ghirardelli Sea Salt Escape Square .375 oz ea., Lindt Truffles .48 oz ea., Individually wrapped. Five included. Weinrich White Chocolate Easter Bar 3.5 oz. It doesn't get any better than this!